Many studies have attempted to identify a single transcription factor that can induce formation of the mesoderm, an early layer in embryonic development, without help from other cellular proteins. None have been successful, until now. In a new study published in Cell Stem Cell, titled "Tbx6 Induces Nascent Mesoderm from Pluripotent Stem Cells and Temporally Controls Cardiac versus Somite Lineage Diversification," a research team, including experts from the University of Tsukuba, screened over 50 transcription factors and found that Tbx6 alone was able to stimulate mesoderm formation in laboratory-grown stem cells, and could cause those stem cells to become cardiovascular or musculoskeletal cells. Pluripotent stem cells provide an important window into the mechanisms of cell differentiation, a critical process during development and maintenance of tissues in humans and other animals, and are vital to the framework of regenerative medicine. 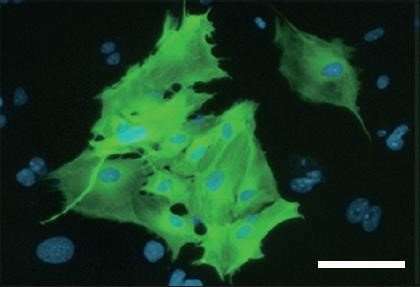 Despite recent successes in understanding and guiding stem cell differentiation, the overall molecular system required for the induction of the mesoderm and its subsequent specialization into tissue-specific cell types has remained elusive because its processes are dynamic, and previous studies have been too small to provide conclusive data. "Tbx6 was already known to be active in formation of musculoskeletal tissue—Tbx6 mutant mice produce ectopic neural tubes at the expense of musculoskeletal tissue—but its expression and function in early/nascent mesoderm and mesodermal derivatives, including cardiovascular lineages, have been largely unknown," says Masaki Ieda, corresponding author on the study. "We were surprised to learn that Tbx6 has a broader role in the formation of mesoderm from pluripotent stem cells." "Our analyses revealed a connection between early Tbx6 expression and cardiovascular lineage differentiation, and we believe that our study and similar studies may change the current view of lineage specification during development," Dr. Ieda explains. "Importantly, this essential and unappreciated function of Tbx6 in mesoderm and cardiovascular specification is conserved from lower organisms to mammals, so this discovery may have wide-ranging applicability in regenerative medicine."